I think hes mad at me. We took him to my parent's place with us for the holidays. He has a room to himself, his heating lamp and everything is with him. Hes warm. Other than the fact that I keep finding his food dish knocked onto the floor with food spilt all over the place and he tried to bite me a few days ago when I tried to take him out of his room. I give him fresh food and water every day. 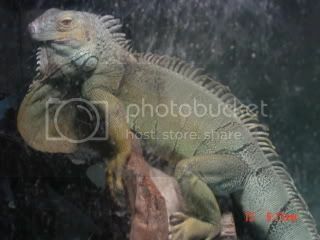 Is there any possible way to get a very upset and stubborn iguana to eat when he hasn't eaten anything in about a week? Do I have to wait this out until we return back home where he will be comfortable? My vet said that stubborn iguanas can go several weeks without food if they wanted to, but they do eventually give in.